If the opening of Mike Solomonov’s all-hummus restaurant in Philadelphia proves anything, it’s that American chefs are only becoming increasingly passionate and creative when it comes to the Levantine dip. In fact, the ubiquitous spread is popping up the menus of more and more New York restaurants — truffle hummus at Claudette, burnt-jalapeño hummus at Empéllon Cocina, and even beetroot hummus at Maman. In honor of everyone’s favorite party snack, we’ve rounded up eleven standout versions available in New York. New to the menu at Gabe Stulman’s West Village bar is a dish comprised of roasted carrots, hummus, pepitas, and crowd-pleasing sriracha. It’s a nice, light antidote to the excellent barbecue-mayo-topped cheeseburger. Alex Stupak pairs big, meaty heirloom black beans with crema, cotija cheese, and a smooth spread of slightly spicy hummus. Price: Part of the $90 tasting menu. There are many reasons to get to wd~50 before it closes, and this amuse-bouche of lamb belly, black-chickpea hummus, cherry, and cucumber is certainly one of them. Sit at the bar to enjoy Marc Murphy’s earthy hummus, which comes with olives and warm, grilled flatbread. The menu changes daily at this brand-new French café, so if you see the open-face crostini with beetroot hummus and ricotta cheese, order at least two. Bar Bolonat’s a bona fide hit, but don’t forget about Einat Admony’s first restaurant, where she serves super-fresh hummus with tahini, roasted garlic, and za’atar pita. And at brunch, you can get Hummus Masabacha with boiled eggs, chickpeas, jalepeño, and a spicy green sauce. “Pain Tunisien” — warm garlic flatbread with truffle hummus — is a dish that sounds gimmicky, but actually ended up winning over many critics (and everyday diners). At old favorite Tanoreen, chef Rawia Bishara serves hummus topped with spiced lamb, pine nuts, and olive oil … for breakfast. Price: Part of $40, five-course Mediterranean menu. 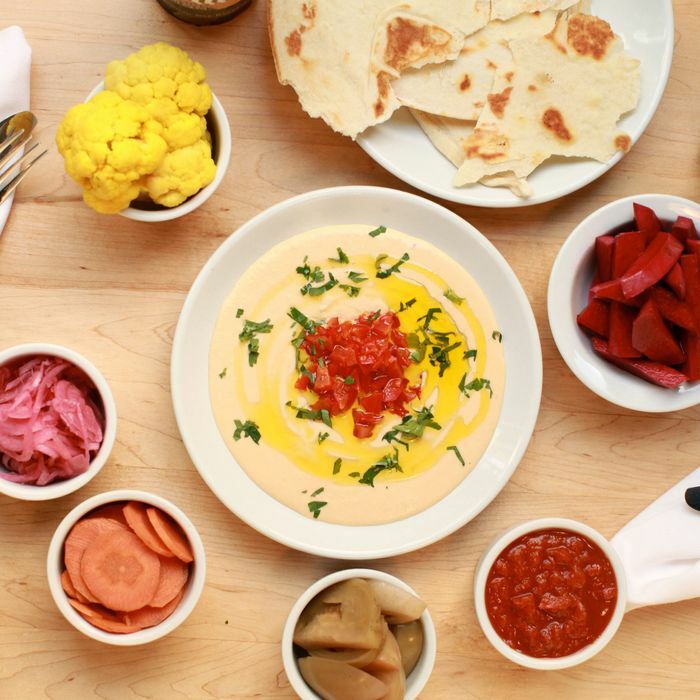 The brand-new prix-fixe menu that chef Eli Sussman serves at Mile End’s Manhattan location includes an excellently delicate hummus spread with house-made pita, beet-pickled turnips, and matbucha — a cooked-tomato-and-pepper salad. This Ditmas Park restaurant’s known and named for its hummus, so of course there are several standout options: mushroom hummus with an onion-cumin stew, tahini hummus with a lemon-garlic dressing, and meat hummus with ground beef and pine nuts. The Williamsburg restaurant’s namesake dinner dish is comprised of grilled vegetables and additional chickpeas over hummus. For breakfast, you can order hummus masabacha, a warm dish that includes eggplant, hard-boiled eggs, and tahini.